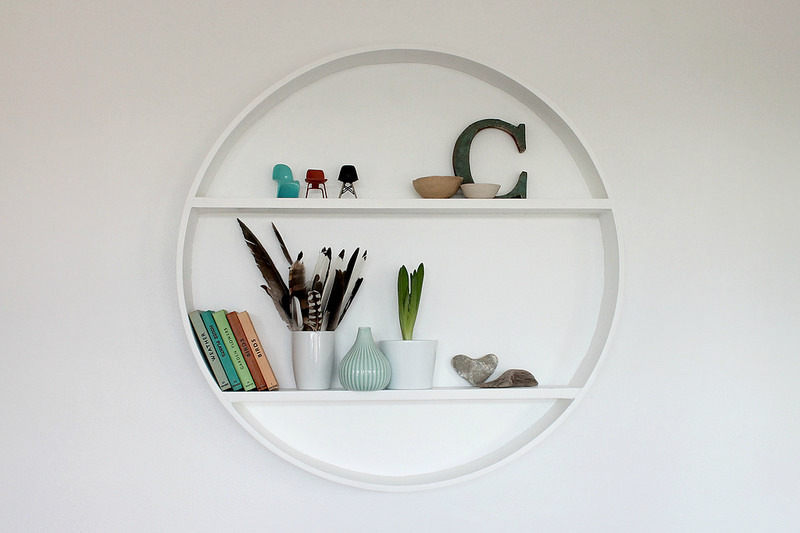 This circle shelf was a bargain I found in Homesense, in the sale section. It was a bit battered, had a distressed finish and a world map painted on hessian as the background. I took it home in the hope I could sand it all back and give it a new lease of life. And after a fair amount of sanding and a few coats of paint, I'm pretty pleased with how it turned out. I've been doing lots of de-cluttering and reorganising this month, but I've still purchased just a couple of new little bits. Like the letter C initial which I just couldn't resist, and the tiny bowls which are perfect for tiny treasures. Its nice to have another surface to put a few of our most recent finds on, like the heart stone and driftwood, reminding me of special days out with the kids. Styling the Seasons is a collaborative project with Katy (Apartment Apothecary) and Charlotte (Lotts &Lotts) Join in and share your story by styling a surface in your home to reflect what each month means to you, then upload your post or picture on social media using #stylingtheseasons. I love that shelf, it's so different. The feathers in the pot look really fresh. Really simple and beautiful. I love your styling and the fact you've customised the shelf. Oh, and I'm a sucker for little Observer guides too! I really like this, it looks beautiful. I wish I wasn't so lazy and was happy to take home DIY projects.. but I know I would end up not bothering and/or doing a botch job of it. I need to get better as these types of projects!